I recently purchased a Token describe as a 1969 Octoberfest Token with a mintage of 200 and made of copper. Since the listings on this site start at 1970. I was wondering if it is a forerunner of Octoberfest and if anyone can confirm the mintage and composition? Also a value and any other information would be appreciated. Is there a good reference manual for these types of tokens ? This is my first post so I hope everything is correct. Re: 1969 Octoberfest Token ? - Any additional info ? As you suspect this was the forerunner of Oktoberfest though its usually considered the first Oktoberfest in Kitchener-Waterloo. In the last half of the 1800s they held several Saengerfests that were mainly German musical festivals but also included gymnastics/sports apparently. They came to a stop in Canada (though carried on in the USA) around WW1 due to anti-German sentiment. By 1969 with the rise of multiculturalism it was felt safe enough to have a celebration of German culture again, though mainly focused on drinking beer. Kitchener, previously named Berlin (re-named Kitchener after the British officer in 1916 due to anti-German sentiments) and Waterloo were founded and heavily settled by Germanic peoples, first the Pennsylvania Dutch (Dutch as in the anglicized version Deutsche, or German) though they were mostly German speaking Mennonites from Switzerland who had originally settled in Pennsylvania. They emigrated to Upper Canada when Governor Simcoe promised them they could remain pacifists for all time according to their religious beliefs. Being a pacifist in the USA at that time with their wars of expansion was becoming difficult and were forced to participate either through non-fighting war support or a special tax to support the wars. Simcoe's promise held firm during WW1 when Mennonites were exempted from conscription. During tne middle 1800s and later many immigrants came directly from Germany helping to industrialize the town/city (Berlin became a city in 1912). German was the dominant daily language in the markets, schools, and churches in the town/city of Berlin until education reforms made English the mandatory language for education and anti-German sentiment during WW1 created anti-German riots, vandalism, arson, and vicious assaults so the language started disappearing from the public sphere. It remained only in the homes and churches but over time fewer people spoke German since it was less a part of daily life though there are still a few German language church services to this day and several German clubs. This is a very good find, the majority of these are made of aluminum, a small number in silver as well as copper or bronze which you have here but I've never seen one before. I would suspect it would be fairly valuable since its fairly rare, the most common aluminum ones maybe go for $2-$4 or so, later Oktoberfest tokens usually about half that much. I have no idea what its going price would be, probably pretty close to what you paid for it if you got it from someone who knew enough about it to know its mintage. 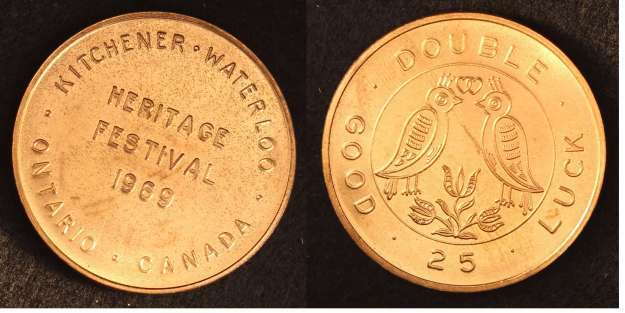 I know of no reference material for Oktoberfest tokens though they might be included in some books on municipal tokens. Thank You for all this very useful information. I have picked up many of the later Octoberfest tokens for between $ 1 and $ 2 and since this appears to be a key token I think I will become an Octoberfest collertor and try for a complete set..